Awareness of toxic mold’s impact on human health has risen exponentially over the past decade. Health authorities have linked toxic mold exposure to serious health problems, including respiratory infections and neurotoxicity. However, the harmful effects of toxic mold are not limited to the lungs and brain; emerging research indicates that toxic mold also affects the gastrointestinal tract and promotes the development of leaky gut. Read on to learn about the connection between toxic mold and leaky gut and how you can restore your gut health if you’ve been exposed to mold in your living or work environment. What Is Toxic Mold and Where Is It Found? Have you ever walked into a building and immediately been hit by an overwhelming “musty” odor? While most people find this smell to be disagreeable, few understand its true implications: Musty odors are a sign of water damage and indicate that a building may be harboring toxic mold. Unfortunately, water-damaged buildings aren’t the only places where toxic mold is found. Mold and mycotoxins also widely contaminate our food supply. Approximately 25 percent of the world’s crops, including grains, nuts, wine, spices, and coffee are contaminated by mold and mycotoxins. Mycotoxin contamination of food is caused by poor growing and harvesting practices, improper food storage, and damp conditions during food transportation and processing. What makes these molds dangerous? The harmful effects of mold are mediated by biotoxins, including spores, cell fragments, endotoxins, beta-glucans, volatile organic compounds (VOCs), and mycotoxins. In this article, I will focus on the effects of mycotoxins, toxic metabolites produced by mold that cause a variety of adverse health effects. The most common mycotoxins found in water-damaged buildings are trichothecenes and ochratoxin, while aflatoxin and fumonisins proliferate in mold-contaminated foods. Some mycotoxins have beneficial properties: for example, the antibiotic Penicillin is a byproduct of the Penicillium fungus and citrinin is a mycotoxin used to produce fermented foods. However, the mycotoxins in water-damaged buildings and food tend to be harmful to our health. They promote respiratory and neurological damage, DNA mutations and carcinogenesis, hormonal imbalances, and impair immune system, liver, and kidney function. However, not all people become sick upon exposure to toxic mold and mycotoxins. An individual’s risk of developing toxic mold illness is influenced by several important factors, including their genetics and their gut health. Who Is Affected by Mold Exposure Symptoms? However, people are not all affected by mold illness equally. According to doctor and mold researcher Dr. Ritchie Shoemaker, approximately 25 percent of the population is genetically prone to develop serious health problems, referred to as "Chronic Inflammatory Response Syndrome" (CIRS) upon exposure to toxic environmental molds. Furthermore, 2 percent of the population have genes that make them susceptible to the toxic effects of mold and mold illness. While genetics play an important role, they are not the only factor influencing an individual’s risk of developing toxic mold illness. In fact, fascinating new research indicates that the health (or lack thereof) of an individual’s gut also influences their risk of developing toxic mold illness. How Do Mycotoxins Alter the Microbiome? Emerging research indicates that mycotoxins induce leaky gut, one of the most common chronic health conditions affecting people today. Toxic mold exposure promotes leaky gut through a series of complex interactions between ingested mycotoxins, the gut microbiota, and cells of the gastrointestinal tract. In healthy individuals, one of the key roles of the gut microbiota is to detoxify harmful substances. Interestingly, researchers have found that certain beneficial bacteria in the human gut bind to and metabolize ingested mycotoxins, protecting us from their harmful effects. Once mycotoxins disrupt the gut microbiome, the integrity of the intestinal epithelial barrier begins to break down. Over time, this promotes the development of leaky gut. Leaky gut is a condition in which intestinal lining becomes more permeable than normal. Enhanced permeability of the intestine allows bacteria and other toxins to leak from the gut into the systemic circulation like the blood stream. Once in the circulation, these substances provoke an inflammatory response that affects multiple body systems, including the neurological, respiratory, and hormonal systems. Trichothecenes, fumonisins, and aflatoxin (other mold toxins) suppress the expression of tight junction proteins, the proteins that bind adjacent intestinal epithelial cells together. A lack of these proteins allows spaces to develop between epithelial cells, causing leaky gut. Mycotoxins generate reactive oxygen species, which oxidatively damage intestinal cells and compromise intestinal barrier integrity. Mycotoxins enhance the virulence of harmful intestinal parasites. Parasites inflame the gut, and the subsequent oxidative stress promotes leaky gut. To make matters even more complex, additional confounding factors can potentiate the harmful effects of mycotoxins on the gut. An inflammatory diet, exposure to environmental toxins such as BPA and heavy metals, excessive antibiotic use, and chronic stress also disrupt the microbiome and promote leaky gut. When these factors are present along with toxic mold exposure, a vicious cycle of chronic inflammation and leaky gut is perpetuated. To heal from mold illness, steps must be taken to remove mycotoxin exposure, rebalance the gut microbiome, and repair the gut lining. If you’ve become sick as the result of toxic mold exposure, there are three steps you should take to address your gut health. The first step is to remove mycotoxins; this can be accomplished with the help of binding agents. The second step is the rebalance the microbiome, and the third step is to repair leaky gut. Several mycotoxin binders are used in toxic mold illness, such as cholestyramine and Welchol, are available only with a doctor’s prescription. While binding agents are crucial for removing mycotoxins from the body, they also bind essential minerals and fat-soluble vitamins. For this reason, always take binding agents 1 hour away from food or supplements. A nutrient-dense diet paired with vitamin and mineral supplementation is thus a crucial part of any mycotoxin detoxification protocol. As I mentioned earlier, a healthy gut contains microbes with the capacity to detoxify mycotoxins. But, what are you to do if your gut microbiome has been disrupted by factors such as mycotoxins and antibiotics, and doesn’t contain optimal levels of these beneficial bacteria? These microbes facilitate the removal of mycotoxins from the body either by directly metabolizing them or by binding them in the digestive tract so that they can’t be reabsorbed. By lowering the GI tract’s burden of mycotoxins, these probiotics reduce intestinal inflammation, and the body can prioritize repairing leaky gut. You may also want to consider supplementing with spore-based probiotics, such as those found in MegaSporeBiotic. While spore-based probiotics don’t directly bind mycotoxins, they repair the intestinal barrier and help heal leaky gut. (14) Rebalancing the gut microbiome with these probiotics will further assist with mycotoxin elimination and speed up the gut repair process. If you eat a diet centered around grains and processed foods, it is likely that your diet contains mycotoxins. A diet that reduces food source of mycotoxins – a low-mold diet – can do wonders for reducing gut inflammation while also providing the gut with the nutrients it needs to repair itself. Here are some simple guidelines for a low-mold gut-healing diet plan. Grains, legumes, and starches should be eaten in moderation to avoid providing mold in the gut with a growth medium (fungi thrive on carbohydrates!). Bone broth: Bone broth provides amino acids that help repair leaky gut. Experts in toxic mold illness typically recommend that people follow the low-mold diet for at least a few months while undergoing treatment with probiotics and binding agents. The combination of these strategies expedites the elimination of mycotoxins from the body, reduces intestinal inflammation, and gives the gut an opportunity to rest and repair. G.I. 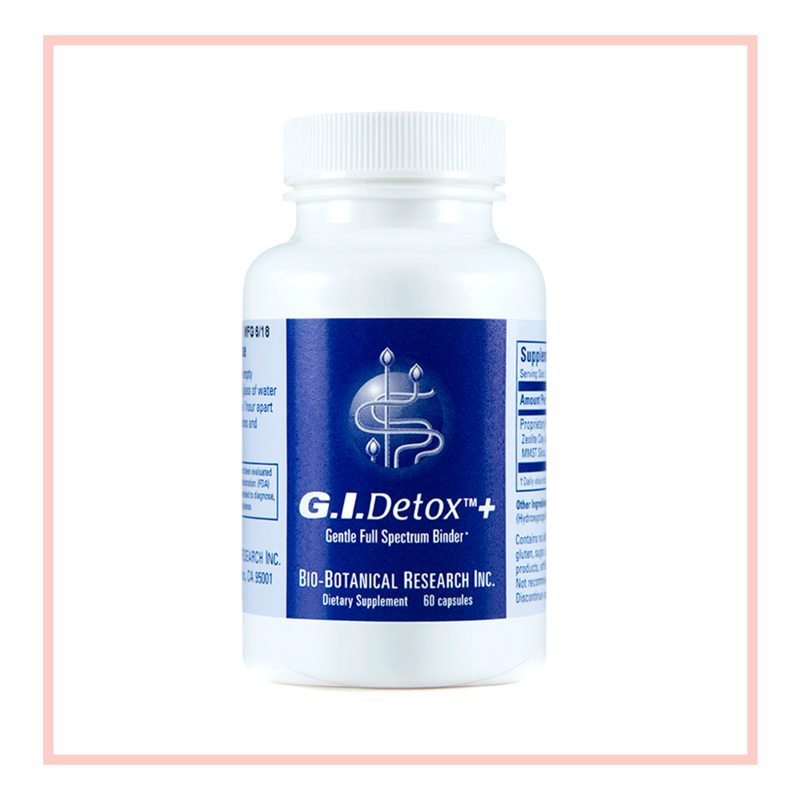 Detox is my favorite resource for binding to and extracting mold toxins from the gut. It is carefully formulated to assist in the removal of mold toxins, heavy metals, and other intruders. To get this powerful effect, it includes a perfected combination of zeolite clay, activated charcoal, aloe vera, and other carefully-chosen detoxifiers. For gut health, MegaSporeBiotic is hands down my favorite probiotic, and is a great way to maintain a healthy variety and balance of beneficial bacteria. You want help for your mold symptoms ASAP! Cut to the chase with this straight-forward guide, outlining my favorite supplements for detoxing mold. As a person who has been healing from mold toxicity, I can personally say these supplements support my daily self-care effectively. Is toxic mold messing up your gut? What have you tried to help you gut heal? Comment below to share your thoughts! *Stay tuned for part 2 of the Toxic Mold / Leaky Gut Connection, where we’ll explain how to test for toxic mold in your body so you can treat it the most effectively. Older PostHerbals vs. Bioidenticals for Hormones: Which Is Better?